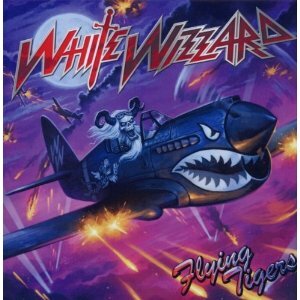 Hall of the Mountain King: Review: White Wizzard, "Flying Tigers"
In some ways, Flying Tigers shows maturation and growth. The compositions here are a little deeper in places than the ones on Over the Top. The influences still draw primarily from bands like Iron Maiden and Cloven Hoof. Leon is still working out his Steve Harris fetish, and his bass is even more up front and key to the sound on this record. But in the songwriting process, he forgot a few things, and they were key elements in the success of Over the Top – big hooks and fun. 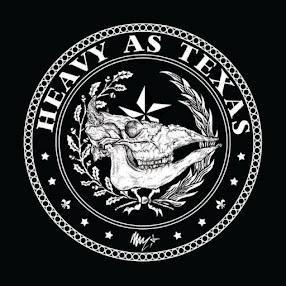 You can hear the effort put into the compositions on this record, and that’s not a good thing. The old familiar flow of songs like “40 Deuces,” “High Roller” and “Iron Goddess of Vengeance,” which immediately hit me on Over the Top, is missing here. Most of the songs feel forced to me. I don’t know if it was because of the up and down year or tensions within the band or what, but there’s something that seems just a little bit uncomfortable in the songs on this record – and not in a good way. There’s some good material sprinkled throughout. “Starchild,” which I believe is the band’s first ballad, is really good. The dark, clean opening puts me in mind of a slow Dio song, and the heavier bits reinforce that. Another slower track, “Starman’s Son,” comes closest to matching the strength of Over the Top. The ballady verse is probably the tastiest bit of music on the record, and the soaring chorus, while not fantastic, at least doesn’t detract from the song. And there’s an uptempo section near the middle that’s really good, and some excellent acoustic guitar work. It’s easily the best offering on the record. Opening song “Fight to Death” is also a winner and about the only song that sounds like it might have come from the Over the Top writing sessions. “War of the Worlds” has a strong verse, but it’s still missing that thing that makes you want to come back. “Blood on the Pyramid” has one of the best riffs, but when it goes for an exotic feel, it sounds kind of stiff and sputtering, not as smooth as that mood needs to be. The 9-plus minute “Demons and Diamonds” has its moments, as well. The intro, another slow and dark piece, is great. But when the pace picks up, the sound is almost a little cartoonish. It’s a problem that a lot of the songs on the album have. They mimic Maiden and Cloven Hoof almost to the point of caricature. They don’t flow, and there’s very little natural energy. White Wizzard never quite puts it together on this one. They offer flashes. “Night Train to Tokyo” has one of the most memorable melodies on the record, but it doesn’t have a lot of sticking power. “Fall of Atlantis” has a nice chorus, a bit reminiscent of modern Lillian Axe, but pales in comparison with pretty much anything from their last record. Too many of the songs here seem to be built as showpieces for Leon’s bass, and, as impressive as his work is, it gets a little tiring as the record goes on. After one listen to Over the Top, there were several songs that I couldn’t get out of my head. After a few weeks with Flying Tigers, I’m hard-pressed to remember any of the songs, and that’s the major difference. There’s nothing on Flying Tigers that reaches out and grabs the listener, and at the end of the day, it’s a decent collection of throwback traditional metal that, unlike its predecessor, I won’t remember a thing about a year from now. It’s a disappointing effort from a band with tons of promise. Here’s hoping they get things stabilized and back on track for the next one.